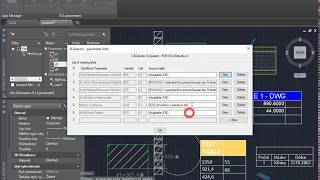 The add-on LISP application XLSparam for Autodesk® AutoCAD® links geometric parameters of dynamic blocks and constraint parameters with Excel XLS tables. In this way you can export parameter values to Microsoft® Excel and subsequently read the changed values back into your DWG drawing. You can also establish links between the values of dyn.block parameters (or other object properties) and given tables, and then drive these parameters by changing the tables (local drawing tables or datalinked Excel tables or dynamic dataextracted tables). XLSparam brings more intelligent parametric behavior to your DWG drawings. Dimensions, rotation, or other properties of drawing objects can be driven by complex computations performed from your Excel worksheets. Entities can dynamically react to the results of BOMs (data extractions) from the same or from other drawings. By changing a single parameter in a table you can influence multiple objects at once. This utility opens vast possibilities of driving AutoCAD drawings from Excel.